Hey guys! 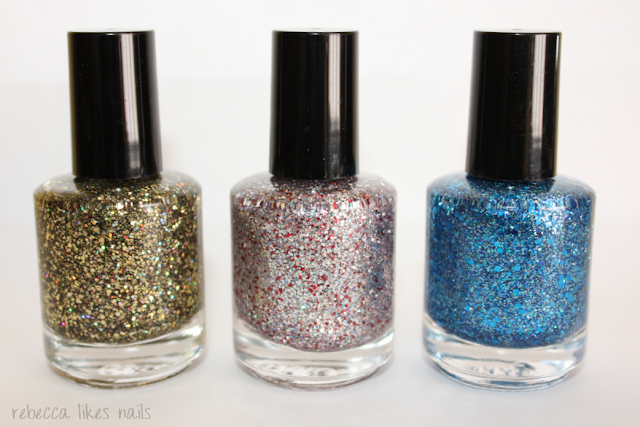 Today I'll be starting a series of posts of Shimmer Polish! The lovely Cindy of Shimmer sent me a whole bunch of her pretties to try out, and I can't wait to show you all their glittery goodness. I had a hard time deciding how to split up the posts - all at once? one at a time? bunches of 6? etc - but eventually I settled on doing them in sets of three. I feel that each polish deserves four or five photos to show it off properly, and I don't want to overwhelm you with a million pictures every day. So here we go with our first set of three! What I really like about Shimmer Polish is that you can tell that a lot of effort goes into the glitter mixes. Each polish has so many different elements, Cindy doesn't just throw one or two glitters into some base and call it a day. Each mix is so fun and pretty, and the formulas are perfect and not gloopy despite the mass amounts of glitter. Most of the polishes can be worn layered or built up by themselves, which I love. I also adore the Shimmer labels. The little heart is so cute! Okay, let's see the swatches! Candace is a mix of primarily black and gold glitters, and some teeny fuchsia/red glitter. The gold glitters are holographic so this is ultra sparkly! Shown is one thin coat of glitter - the formula spreads easily and perfectly. You would probably expect to see this layered over gold but I went for a crazy combo and I like how it turned out! I think pretty much every Shimmer Polish would look good over anything. It was hard to get clear photos of this one because it is so darn reflective! Lucie is mostly silver, with lots of red, and some bluey-green. Iridescent maybe? It's so hard to tell because they're so sparkly. Haha! For this one I used two coats over silver to make it super blingy. This could make for a nice Christmas/holiday manicure! But of course it is nice all year round, too. Blue lovers rejoice! All sorts of blue glitters in this one. This is just one coat of polish over a blue base. I really love this one! Jewel-toned glitters always get me. What do you guys think of these awesome glitters? I hope you like them as much as I do! And I have a bunch more to show you in future posts. In fact, I think I'll post the next set tomorrow. Candace is so pretty. I love the color that you paired it with, great combination! The coverage on these is incredible - I need to go take a look, the glitters I have are definitely not as nice as this! This is a brand I really want to try! These are all so pretty! I really love your combos. AMei.. queria todos.. muito lindos!! I've never seen a Shimmer polish that I didn't love! I need more!